Sermons | Скит Святителя Григория Богослова. Unearth my soul, tears are falling. Hiding their faces clouds are crawling. Teasing my thoughts rivers are flowing. Stars in the sky reaching us slowly. Angel of mine do not let me fall. Angel of mine hear me calling. Angel of mine do not let them near. Angel of mine cover me with your wings. That’s a matter of course. All the Depths of the land. With a touch of a breeze. To protect you from sin. By choice they make today. Intrigued by only what is pleasant. We God no longer trust. Death turns them into dust. One may believe or not. To love dance of the heart. Heart would be nice and hot. To draw the lucky card. Dance out of your heart. The Cunning of the Devil. Satan, in Aramaic literally – ‘opposer’, doesn’t just come out and say it. He, often times, starts with a true statement – to give his scheme more credibility. Then, he slowly starts to draw our attention from God to something else, like ‘art’, which, in itself is pretty good, but not necessarily God, and much more neutral. Eventually, satan begins to show his own crafty ‘face’ though still imitating good values. Our attention is fixed not on God, while some trait of a doubt is introduced – ‘if you successful,’ and even then – concentration is not on God but on one’s earthly values, ‘Heart would be nice and hot’. Again, concentration is drawn away from God, switched from ‘The Goal’ to ‘means’ (art of whatever, as long as it’s not God), and, at the same time, some supporting un-Godly ideas, such as ‘luck’ are introduced. And then – you are it. And saved from condemnation with no end. with tears of redemption their voices heard from all-night stand. The debt to death trully’ve been met. Eyes of the child reunites with that of old. Along with fellow time it heals the scars. Twins with eternity, a mystery of future Kingdom. It’s silent features neatly woven to the pattern of creation. Has many colors and presents itself in many different shapes. A touch of it forever alters, fascinates. Sometimes it lifts you up to Heaven. It has its own unique degree, it’s angle crucial… oh, dear. Condemns, forgives, hates, loves, agrees, or disapproves. Makes foolish fall asleep. If you ignore it you will lose. What do you do? What do you mean? – To heal the wound, to sting the dream? To cool the souls, to make them hot. Soften the hearts, or make them hard. The art of making and destroying. -Imagine One Who gives the gift! Random moments of our lives. They have the power to change and to surprise. To exercise the power of holding things, or give. They are setting up the stage and carefully writing comments. Whatever they let go – soul definitely gets. The kings- the rulers of the day – the random moments. The altar to the past. Is turning here to dust. Are welcome here to rest. ‘The LORD knoweth the thoughts of man, that they are vanity.’ (Pss. 94:11). Are brought into its shrine. Are playing parts of greed. Are trapped under its feet. Is when it wouldn’t hide. Death in a final scene. ‘Turn away mine eyes from beholding vanity; and quicken Thou me in Thy way. (Pss. 119:37). Old lady tiredness is working on my tired mood. Old lady tiredness is binding my every tired move. Old lady tiredness follows me throughout the tired day. Old lady tiredness never retires away. Old lady tiredness is humming quiet tired tunes. Old lady tiredness her tired eyes – two tired moons. Old lady tiredness repaints loud noises into silence. Old lady tiredness is shooting me with tired lies. Old lady tiredness breaks up my body into many heavy tired parts. Old lady tiredness throws at me a thousand of yawns. Old lady tiredness is carrying her tiring aromas in her tired bag. Old lady tiredness has built her tired throne over my tired bed. Old lady tiredness has spread a lot of tired snares everywhere. Old lady tiredness is wearing her tired shoes on tired feet. Old lady tiredness is putting me to sleep. Old lady tiredness leaves my house in a mess. Old lady tiredness the youngest sister of the death. Old lady tiredness is battling my health. Old lady tiredness enjoys her very very tired self. Old lady tiredness our tired flesh is her control. Old lady tiredness our restless spirit is her fall. Old lady tiredness ‘s too tired for my ever-waking soul. The stage of life… isn’t this strange? I turn into a different man. The man I didn’t know then. All that I see – I put in lines. See many lives, great many faces. Forgotten feelings, and lost hearts. The gates of hell with open lock. Cry of the soul that fights the sin. ‘Out of the depths have I cried unto thee, O LORD. With deep marks from the fights. To slay prince of the dark. And the call of the horn. Splashed with blood of the men. Life and death in each hand. They will fight ‘till the end. Prince of darkness is dead. War is men’s blessed way. May happiness come or go away. Good health can leave, or it can stay. Tomorrow is going to be another day. ‘for there shall be no night there’ (Revelation 21:25). The frontier of the Unseen Warfare is the life saving art of cutting off tempting thoughts! I stumbled over Book of Dreams. I wiped my eyebrows silently. Outside the night descended steadily. Stars in the sky ascended readily. And felt its grip on me. And peeked in over edge. ‘Ye are the light of the world. and it giveth light unto all that are in the house’ Matthew 5:14-15. It shines in the night. Disputes of the Fall continued – ‘A Predator’. Each man would only certainly live once and only. I suddenly felt hurt and lonely. With the clouds above that followed me. ‘Do not deceive yourself. I see it in your eyes. I saw the way you danced, when being just a kid. A predator… one of the finest breed! I see pursuit, feel agitation of a midnight race ahead! I feel the taste of blood, and of a brand new hero rise! At rising sun over the hill! The love for wailing winds, unlike all other human sons! Right after feeding on live food in hunted castles! You are following God’s will,’ continued he, ‘in vain. It is unnatural to humans, hurts! It brings up pain! In doing so tomorrow – you will fail again! Excuse yourself before you’ll go insane. I want to help you being on your own. Don’t be afraid. Go on! Follow me fly through the sky! Raise up your hands. Do not be shy. You won’t be stricken down. Try! There is no power in ancient curse! Don’t ever hesitate in what is yours! The Bible… is a well-put lie! I am taking what is mine! And God, He doesn’t care! Why being pushed around for so long? Don’t be ashamed of being born! Each day is only once and gone. Each man would certainly live once and only. But of a total loss. The one that’s always in the process of the fall! And ugly open mouth – ready to debate! It hides inside of you! Think for yourself whether it’s true. What happens now? What’s going to happen then? What of the world left unseen? Of those who lived through pain and tears. When blood’s been shed and death appears. When moon is up for wolfs to plea. When storm is near but the wind still shy. When words unsaid, your eye can hear. With moving lips and dancing eyes. With the look that turns to ice. – You have to use Light as disguise. – You kill by one, but I condemn by nation size. – Teach them self-confidence, then, drown them in pride. – Change love to humanism… and hide. – Confirm as true, then, make believe that to Him lead great many ways. – Play wrong interpretation, then, logical depression, suicide. – So, what’s the difference between him and… wooden chair? – Oh, you don’t say that we are otherwise? And your ways sincere and right. Feelings and thoughts must never fight! with your dreams in God’s realm. and your prayer spring up and thrive! Not being afraid to try… to dare. Let you be, let you be! On His throne He sat! For the Gift I got! A simple magic that breathes in us. Enliving lives with sense of sweet home. Roses in bloom to show their faces. Controls the sways of shameful fear. Nothing unusual… a simple magic! ‘I am come to send fire on the earth’ (Luke 12:49). And when the day of Pentecost was fully come, they were all with one accord in one place. And suddenly there came a sound from heaven as of a rushing mighty wind, and it filled all the house where they were sitting. And there appeared unto them cloven tongues like as of fire…’ (Acts 2:1-3). And last week on the way to st. Herman of Alaska monastery in Platina, CA I thought/felt… The Airborne! I know thy works, that thou art neither cold nor hot: I would thou wert cold or hot. So then because thou art lukewarm, and neither cold nor hot, I will spue thee out of my mouth. (Rev. 3:14-16). Please, follow me, don’t mind the smell. Unless, of course, you want to stay. Though, few of you may… disappear. And, I’ll make sure that you will. First stop is Chamber of the Greed! In all its sees – it plants its seed. It lives to get – on things it feeds. Only it’s worse and can’t be cured with ease. Please, check you ‘pockets’… oh, never mind. Next stop is Chamber of the Pride! With her death started… hell begins. Be extra careful, spread out wide. If she would talk to you – don’t answer, hide. Don’t try to argue, she is always right. Before you know it – you will lose the fight. Next is my favorite – the Chamber of Obsession! It always plays the role of god clothed in aggression. It follows you, or rather, haunts! It binds your hands’n mind… enslaves your spirit. One has to experience it to believe it! Now, take any person next to you – drag him away. We shall proceed on our way! Next stop is Chamber of the Lust! A very few haven’t been drowned in it’s flow. A very few escaped the chains of luster. The rest of us well-caught in this disaster. Come now people, that’s enough. Above this world of dark, of hell. Come, follow me, don’t mind the smell! I am here to win. In a hurry spread, spread. Sending it to fly, fly. And the things that’re not, not. Don’t say words that you don’t mean. Have a peace of mind. Mind? Idle words and such, such. Thank you very much, much. Events were measured by the line. My sight’s been blessed with what I got. Under the sky in God believing. In mortal body from my birth. I fought in battles for my king. Until the time when I was gone. On battle field amongst the roar. Beautiful lady was so dear. I knew them well, they were the best. The best dream-weapons of the West. I fought all day… I couldn’t rest. I felt her hands of soothing love. Beautiful lady was my Death. The war around raging, bloody. She hummed the song for two of us. Sung in the way they did before. After separation of Church and state High Self-Esteem, so heavily preached in our society today (schools, media, etc. ), seems to be an alternative to In God We Trust. Unfortunately, not many see it that way. However, it is hard to imagine Humbleness, Humility and Obedience, taught in the Gospel, to be the fruits of high self-esteem. Who is wiser, stronger, biggerrrrr. Stand on your ooownnn! Shine like a staaarrrr! Pinch yourselfff, you must be reallll. What is wrong with Atheism? – NOTHING! Having itself to worry about. Having itself to feel for. People often times ask me: ‘why do I have to go to confession for? I’ve done NOTHING wrong! But there is the wall. But, I am hitting the wall. And strong is the wall. But hhhigh is the wall. To get the clue of what she meant. I grew in strength to weigh the reasons. Are basic keys to why we die. Why ‘apple pie’ does taste so nice. Truth often comes as a surprise. To be like God, one must be wise. To know the truth apart from lies. I hide myself in grieve. Death in the eye I stare. Away from Earthly vast chores. Lost and confused God’s lam. And brought to Holy Ground. Run away rainy day, run away. of my heart lasting pain take away. Wounded soul, please don’t call. Run away. Lasting pain take away. Run away. Run away. Lasting pain take away. Run away.Run away.Run away.Run away. I wish I knew how I was wrong when I misunderstood Your song. And now my breath escapes my soul, and I believe in timeless fall. They all have won, they all belong, they all have sung Your precious song. And now my heart beat all alone, and I just stare at them ’till dawn. I’ll wash myself in rain, of tears heavy rain. Hey, life, wait for me. Hey, life, wait for me… for a moment wait for me. Hear this song. Stop. Don’t run. Listen to me. Don’t run. Please look at me. Don’t run. Hey, life, wait for me… Just for a moment wait for me. To hide my tears, hide the pain. Would stop in morning rain. I’ll clothe myself in rain. Why do You have to flee? Why can’t You see – it is me? Don’t run away from me. Of the life of mine. It’s your revenge and prize. But all-too-human life of mine. That throws me into disbelieve. Turns all my thoughts away from Throne. It puts me down, makes me lie. It drowns me in pride’s commotion. My all-too-human set of mind. My tired feet carrying me ahead. Some quiet thoughts circulating in my head. Shining innocence from the time I was born. Intuitive reluctance to proceed if something wrong. My restless heart hammering messages into my soul. A pair of eyes to see ahead, so I won’t fall. Two brothers-hands working together, feeling strong. My agents-ears telling me what’s going on. The sequence of events I am going through. The people I am talking to. In what and how I believe. Then, how come I’m going to die? Will is strong, leading your soul. Will learn once more, they are to fall! In the Heavenly World of The Son! Shaking the ends, the ends of the Earth. Letting the beast – get all he deserves! Claiming your strength in The Name of The Lord! Holy War is the name of this world! Wetting the flanges of Earth’s proud persistence. Refreshing memories and tempting thoughts. Shooting mosquitoes down, usual procedures. Giving birth to a brand new life. God is your Shepherd. Praise the Lord. Just do your best and praise the Lord. Relax. God sees you. Praise the Lord. Remember, God has also been abandoned. Praise the Lord. When you fall down, wounded, hurt, get up; pick up your sword. God counts all your bruises. Praise the Lord. Rejoice in faith and have no fear. Praise the Lord. It doesn’t matter how I feel. I am myself. I am standing still. Against all odds, I am standing still. Ends – blossoming the land. With fruits that made us wise. Awakening of sleeping beauty from it’s bed. With bare skin and bones. Earth moves away from Sun/Son. Would beat it’s feelings numb. until the death will come. Of those who still believe. The Spring will come. Amen. And putting everyone to debt. Her name, her fate, her real price. Why this notion of decline? With no memory, no ends. Run for your life, my dear friend. Run very fast. Run like a wild! The world is harsh and men are week. Don’t let them trick you into doing wrong. Great many lives are lost in a rush. There is no use into going astray. Relax, my little baby; turn unto your side. A lot of humans are betrayed by pride. It will care for you all the way to the end. May your dreams be kind and sweet. You will need a lot of new strength to go on. The day runs after night. The Moon flies after Sun. I joined this life of race. I kept the steady pace. Life on the run – what does it mean? Are not there other ways? It hides its face in beautiful disguise. Then stops the moment and treat stars with advice. Old people say that there is a limit to what one does during the day. The midnight sky would clear that and take the tiredness away. Then rests them all on airy pillows and silently prays. Morning may come only when night is done. Wake up new life, new laughter, lots of son! Yesterday’s worries, pain, and tears – they’re all gone! By night the world is ready for another run! ‘What is the Divine Gloom? – by Dionysius the Areopagite, The Mystical Theology. Or something that I am playing. To beat in a certain way. First time it’s Me (Rev 3:20). First time it’s you (Gen 1:27). Once, there was a Little Apple Seed. It lived with its brothers and sisters in a big round apple. This big round apple grew on a big apple tree in a beautiful garden near the pond. ‘And what is this they are saying, my love?’ Asked Mother Apple. Little Apple Seed felt good listening to his mother’s words. It felt good and warm and happy. Every day Little Apple Seed would ask his brothers and sisters, ‘Do I look a bit bigger today? Did I grow a little in size from the way I was yesterday?’ And every day it would think, ‘I certainly feel a bit stronger today.’ His brothers and sisters only smiled at him as the days changed nights, and nights changed days, until one day, something happened. One day, Mother Apple fell from the tree bumping into many pieces, turning upside down, and spinning left to right and right to left until it hit the ground with a loud thump, bounced into the air again, spun around a few more times, and crushed into a rock by the road near the pond with a cracking sound braking into two, sending little apple seeds flying all over the place. When Little Apple Seed finally opened its eyes, it was dark all around it. It tried to call for its mother, but there was no answer. It tried to call for its brothers and sisters, but only wind could be heard somewhere up above, and many new and somehow different sounds echoed around. Little Apple Seed felt lonely and sad. It almost started to cry, when it suddenly remembered the words of its mother saying, ‘You have to be strong, and you have to be yourself… and all your dreams will come true.’ ‘I have to be strong,’ repeated Little Apple Seed in a very quiet shaky voice that sounded more like a squeak under wet and dark ground. ‘I am an apple seed, and one day, I will become a tree.’ Little Apple Seed started to repeat these words over and over, again and again – until, it fell asleep. Little Apple Seed woke up! It woke up and said to itself, ‘What strange dreams I dreamed. In one of them I saw myself becoming a tree.’ Little Apple Seed started to laugh, and it opened its eyes and… in outer wonder found itself above the ground! That is, its roots were firmly planted under, with its head being way above the ground. In fact, its head was high enough to see the pond and other young apple trees around itself. Young apple trees could see the sky and the sun, hear birds and smell young green grass. There was also a wonderful aroma of an early summer morning rain. And Little Apple Seed felt good and happy, and it said to itself, ‘I don’t think I am a little apple seed anymore. Well, at least not as little as I was.’ And it smiled to itself and to everything and everyone around. Reversed Perspective in Orthodox Christianity. Reversed Perspective as the key to Orthodox Christian Mysteries. What is Reversed Perspective (RP)? Some may know RP from studies of genuine orthodox Christian iconography. In an orthodox Christian icon, unlike religious painting, subject-Object relation is in reverse. For example: if one looks at a ‘regular’ picture, the farther subjects are from the viewer(the object) – the smaller they are. For example: the road narrows towards the horizon. In an Icon, on the other hand – it is in reverse. That is one of the reasons genuine orthodox Christian icons look a little ‘unrealistic.’ However, the icons portray and teach, in fact, the actual state of life, as oppose to how it may appear. Thus, when you look at an orthodox Christian icon Object-subject relation change places or reverse: it is not ‘you – the object’ who looks at a subject on the icon, but it is ‘you – the subject (created being),’ who humbly stand in front of the Object (Creator) Whose Image is on the icon. RP is a very important truth in orthodox Christianity. 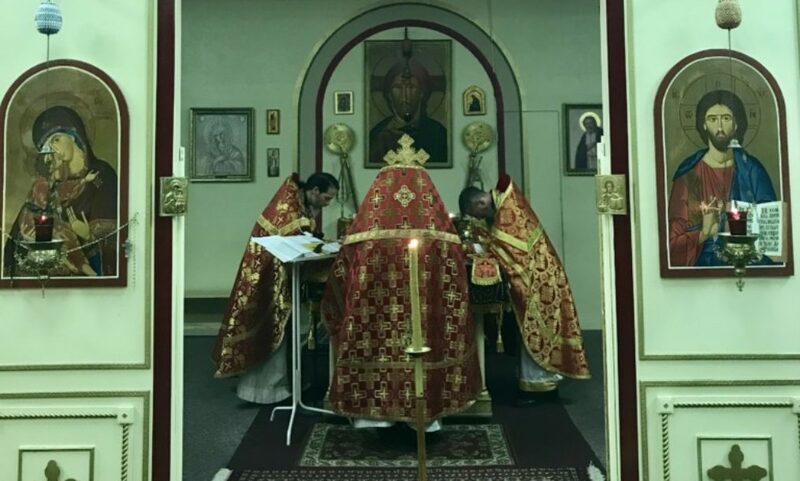 RP is why, in orthodox Christian countries like Russia, icons are usually situated in the upper East corner of the room, and not on the flat wall. The reason comes from understanding RP: in the upper corner of the room our 3-D world (length, width, height) come to a point (dead end) – and this is where dimensions of the icon in RP – begin to broaden, open up. just like it often happens in real life. In orthodox Christian church everything is in harmony. Thus, it would’ve been strange if the principle of RP could’ve been seen in iconography only and nowhere else. In fact, in genuine orthodox Christianity RP is everywhere and in everything. In architecture of the church RP is manifested on many levels of which, for the sake of this short essay, we’ll only point to one, namely: inside vs. outside. Unlike many civil buildings – orthodox Christian churches are built and decorated in such a way that all the beauty, like iconography, is on the inside, while outside of the building is usually pretty plain. After all, ‘the kingdom of God is within you’ (Luke 17:21). Again, it would’ve been strange if the principle of RP could’ve been seen in iconography and architecture only and nowhere else. Gospel is written, in many ways, in RP. It is not a person who reads the Gospel as some sequence of events and different teaching, but God who talks to a person and transfigures his/her heart. On another level, beatitudes are written in RP. For example: ‘Blessed are those who mourn, for they will be comforted’ (Matthew 5:4). In the world outside the church we don’t usually consider those who ‘mourn’ or ‘poor in spirit’ blessed. Again, it would’ve been strange if the principle of RP could’ve been seen in iconography, architecture, and the Gospel only and nowhere else. Orthodox Christian Saints live in RP. Especially, fools for Christ. People in the world dress in beautiful clothes to hide their nakedness underneath, while fools for Christ dress in rags to cover their spiritual beauty and richness within. But not only fools for Christ live in RP. Thus, for example, we read in the troparion to st. Nicholas the Wonderworker, literally the following: ‘Because of your humble life, heaven was opened to you, Because of your poverty, spiritual riches were granted to you…’ – a perfect example of RP. Again, it would’ve been strange if the principle of RP could’ve been seen in iconography, architecture, the Gospel, lives of saints only and nowhere else. Prayer on many levels is in RP. For example, the way prayer is read in orthodox Christian church – monotonous chant kind of prayer, where main emphasis is on meaning as oppose to outward theatrical form of presentation. Or, the fact that prayer is not a monologue, but, a dialogue – and, as such, in prayer, according to RP, I have to learn to listen more than to talk. Church service is done in RP. In orthodox Christian church – church services are usualy really long and sermons are short, because, according to RP, it is best to talk to God about people than to talk to people about God! Orthodox Christian Theology is in RP. For example, the question: ‘how did you find God?’ is not in RP because God is not something along the road that one can accidently find. According to RP – I didn’t find God, but He found me! God is always the Initiator, not me. Here is yet another important application of RP: if one wants to find out who he/she really is – he/she has to get to know God first, and not the other way around, because we were created in the image of God. Thus, the idea to know one’s self to know God is wrong due to lack of knowledge of RP! In genuine orthodox Christianity RP is everywhere and in everything: Trees and flowers grow in RP – not narrowing towards the Sun but opening up towards the source of light as an example to us. Genuine family life and love are in RP. For example: I don’t get married because I am in love, but, according to RP, I get married to love. Thus, according to RP, words ‘I don’t love him/her anymore, therefore we break up’ don’t make sense. The Perfect Love, according to RP, is the one on the Cross as ‘greater love hath no man than this, that a man lay down his life for his friends (John 15:13). Not the other way around. Another example of RP: If you don’t love God (Mark 12:29-30) – you won’t be able to love anybody… you won’t even be able to allow yourself to be loved!!! We as human beings are in RP on many levels. For example, man is so small compared to the whole universe; however, Whom entire universe can’t contain – man can! Holy Theotokos was carrying God in her womb; Christ walked the Earth in human body, etc. Thus it is not I, who being so small, am a part of this universe, but, according to RP, the entire universe is a part of me, as what our universe has – I have also, but Whom entire universe can’t contain – I can! God’s providence over/about us is in RP: ‘And we know that all things work together for good to them that love God, to them who are the called according to his purpose. For whom he did foreknow, he also did predestinate to be conformed to the image of his Son, that he might be the firstborn among many brethren. Moreover whom he did predestinate, them he also called: and whom he called, them he also justified: and whom he justified, them he also glorified.’ (Rom 8:28-30). How? Because God is above time. Therefore, He ‘foreknows and predestines’ those whose free will, later, will lean towards Him anyway. Our orthodox Christian saints open to us the mysteries of RP by their lives. St. Seraphim of Sarov said: ‘Acquire the Spirit of Peace and thousands around you will be saved.’ That’s RP. Some hundreds years later, here in the United States, more saints proved that. First saint (of many), whose life is a perfect example of RP is st. Herman of Alaska. Just look at his life from a point of view of a missionary to The United States and see whether it makes sense outside of the RP. One of the best orthodox Christian missionaries: didn’t speak English, lived on an island on the outskirts of the North American Continent, no printing press, no radio, no TV, neither internet nor computer, we don’t read his sermons, he fell asleep in the Lord 30 years prior to sell of Alaska to the United States of America, and, he wasn’t even a priest. The only thing he did (one thing needful) – he did acquire the Spirit of Peace and ‘thousands around him are continuing to be saved!’ That’s RP. Second saint (of many), who has not yet been glorified as saint, is father Serafim Rose of Platina, CA. He applied RP in his life. He first had a front store shop/mission on Geary Blvd. in San Francisco in California next to a big Russian Orthodox Cathedral (1960’s) with logical idea that people would pass by and notice ‘man in black,’ walk in, ask, and, thus, get introduced to Orthodox Christianity. Dozens of people did. Then, According to RP, he moved far away into the hard-to-reach wilderness of Platina, CA (1970’s) and started to pray more in ascetic struggles acquiring the Spirit of Peace and, lo and behold, hundreds of people started to flock around him and be saved. Then, he, having acquired the Spirit of Peace, fell asleep in the Lord, and, now thousands around him are being saved. That’s RP. To understand why orthodox Christian monks go into the wilderness, as oppose to becoming ‘social workers,’ because they love us – one has to understand RP. Thus, if I love my neighbor, I will ‘go into my room, and shut the door, and pray to my Father in secret; and my Father who sees in secret will reward openly (Matthew 6:6)’ and thousands of my friends and relatives will be saved. That is real love. One may ask, but what about saints like st. John Chrysostom? According to RP, we are able to hear and follow st. John Chrysostom not because of what he did and/or wrote, but because of who he was – and he was/is Holy, that is, he acquired the Spirit of Peace. That’s RP. I, myself, is an example of RP. I grew up in former Soviet Union in a family of atheists. Growing up I’ve never seen an inside or outside of a church as they were all destroyed in our town. I’ve never witnessed a prayer or saw an icon in our house. I’ve never heard a single sermon. I’ve never seen or read a Bible. The first religious book I read was Koran, the second – Bhagavadgita, third – Tao De Ching. How is it, then, that I became an orthodox Christian priest? I know. It is because someone next to me quietly acquired the Spirit of Peace. And, I, may not know his/her name or face, but am thankful to him/her as I am thankful to all who understood RP and acquired the Spirit of Peace.